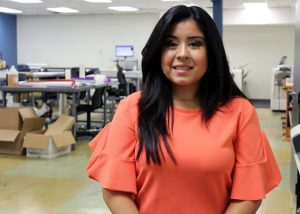 (HARLINGEN) – Megan Trevino is a Digital Media Design student at Texas State Technical College. The 26-year-old expects to earn her associate degree in Summer 2019. Although busy as a work study at the TSTC Print Shop, the social media chair for the Junior League of Harlingen and media team leader at Abundant Life Church, the Harlingen native has maintained a 3.7 grade-point average. After I graduate I plan on concentrating full-time on my business “Megan Monique Designs.” I already offer graphic design and marketing services to a few business owners and realtors. My dream job is to continuing growing my business, growing my clientele and being successful in my endeavors, especially because this is my second chance, second career choice after being unable to find a job with my bachelor’s and master’s degrees in business administration. My greatest accomplishment at TSTC has been maintaining my high GPA because balancing a full-time class schedule, my business, my work-study job and extracurricular activities has not been easy. The greatest lesson I have learned is that it is okay to take risks. I took a huge one coming back to school, but with the support of my family it has all been possible. I have found nothing but doors of opportunity opening in my favor. All of my Digital Media Design instructors have influenced my success. They are always available to lend a helping hand and to share their knowledge. As experienced professionals who have also worked in the field, they have been able to advise me on my business also. My advice for future TSTC students is to soak up as much information as they can, ask a lot of questions, remember that your instructors are there to help you succeed and never give up. This entry was posted in Harlingen on August 13, 2018 by Amanda Sotelo Sotelo.